Earlier this week I posted about what a pretty perfect day for me would be like. I wrote it that way because of how overwhelmed by my life I was feeling in that moment, and I wanted to speak up for my personal happiness and sanity. But before sitting down to write that post, I had thought I might write about what I would want for the world at large, if I had my way. About things that really matter to me, that tug at my heart and I feel compassion for. I asked my 9 year old son if he knew what compassion was. He said he sort of does, that "it's when you have compassion for people". When I asked him to clarify what having compassion for people IS, he didn't really know what to say. I told him that you have compassion for others when you are able to put yourself in their place for a minute and try to get a sense of what their life is like. When you see what some one's circumstances are and feel something about it. Maybe you want to help, or maybe you just show concern. It's also when you are KIND to others because they need some kindness. My son's attention started to drift so I stopped there. But there's quite a bit more to it, isn't there? The words empathy, grace, humanity, kindness, mercy, tenderness and charity are synonymous with compassion. Further, I think in order to feel true compassion, you have to be able to let go of snap judgments. There is a difference between the sort of judgments arrived at via intelligence, sense and reason and the kind that involve ignorance and misunderstanding. 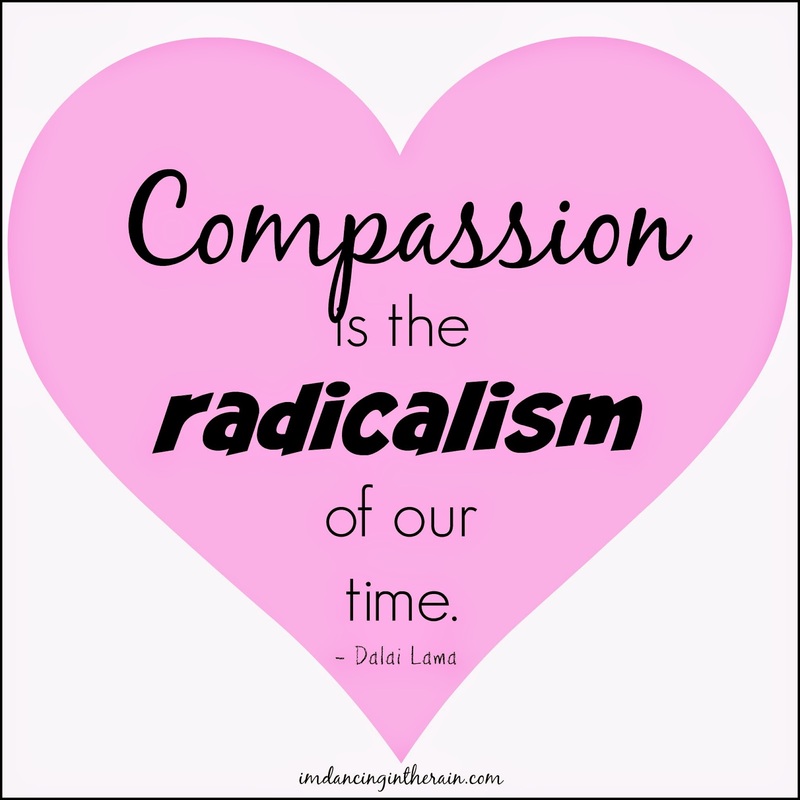 You cannot have compassion for others when you are coming from the latter. Experience lends to compassion. I have compassion for moms dealing with a toddler having a tantrum in Target because I've been there. I have compassion for the disabled because I myself have a disability and I have known other disabled people. I have compassion for a woman's right to choose because I have had the need to exercise that right. Sometimes, though, you feel a sense of compassion for something you have never experienced. I am extremely moved by the plight of those who don't have enough food to eat, even though I have never been in that position. I feel so strongly about that issue because food is a BASIC HUMAN NEED and I cannot fathom how terrifying it must feel to go without it. To not be able to feed your children...? I do not judge whatever circumstance brought an individual or family to a place where they must seek handouts for food. It just doesn't matter to me. 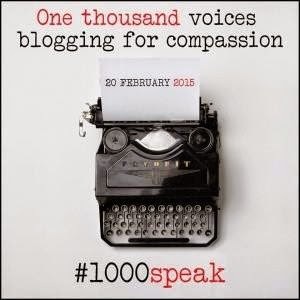 Today is the day when over 1000 bloggers are coming together to speak out on the subject of compassion. When knowledge of this grassroots movement came to me I knew I had to lend my voice. Because of all the things I said above, but also because of my husband. Besides my children (because being some one's mom just turns your heart into mush), no one has taught me more about feeling and showing compassion for others than Mark. Everything he has been through since being diagnosed with Type 1 Diabetes at age 9, and the way he fights, has been amazing, gut-wrenching, beautiful, heartbreaking and inspiring to witness. Being his wife, while stressful and scary, is also my honor and privilege. As it turns out, I am putting the finishing touches on this post after getting the news that Mark's dialysis catheter came out and his clinic had to have him transported to the hospital. I could have thrown in the towel, using the excuse that I got worrisome news, I'm stressed out and don't think I can finish this post because AHHHH! Treat others with compassion in every way possible. Don't judge what you don't know, and be kind. The world really needs it. but there's no denying, he's an exceptionally wise person. If you too would like to be a voice for compassion, please share this and other posts you might see floating around social media today and over the weekend with the hashtag #1000Speak. I will be sharing others too; let's get it trending! Also, check out the Facebook page: 1000 Voices Speak for Compassion.